DBCC DBINFO WTIH TABLERESULTS – In which SQL Server version was this database created? If you work for a product based organization, you would know that databases created in versions as old as SQL 7 are still around. 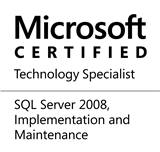 The only thing is that over time, they have evolved via upgrade programs which have upgraded them to the latest and greatest levels – running on latest editions such as Microsoft SQL Server 2008 R2. How old is this database? DBINFO: This, to the best of my knowledge, is an undocumented DBCC procedure. This means that it does not come with any sort of warranty from Microsoft (and also none from this site and me). It is therefore advised not to use this in production environments. Next up, as the name suggests, DBINFO provides “insider” information about the database – something that is not available regularly via viewing the database options or via any DMV. The details of each and every result option is not in scope of this discussion. You may want to follow posts on SQLSkills [Paul Randall (blog)] for insights into DBCC from the guru himself. In addition, we have a 4th output format – output as a table. The WITH TABLERESULTS clause specifies the results in a tabular format that can be loaded into a table. By default DBCC DBINFO does not return any results. Therefore, we either need to use option #3 (TRACE Flags) or #4 to display the output of the DBINFO command. In the query I have mentioned above, we used the TABLERESULTS option. If we look at the fields – dbi_createVersion and dbi_crdate, we can see that they indicate the SQL Server version in which the database was created and creation date/time respectively. So, now we know that this database was upgraded from another version of Microsoft SQL Server (dbi_createVersion is different when compared to dbi_version). Also, we know that the database was created first in August, 2010. I trust that the above information will be helpful to you sometime in the future. This entry was posted in #SQLServer, Blog, Imported from BeyondRelational and tagged #SQLServer on October 10, 2011 by nakulvachhrajani. And where is the info/table that will convert the DBI_Version number to the SQL Server Version designation? The dbi_version list is not documented in the Books On Line. One can run this `DBCC` statement against the `model` database to know the version number for that version of SQL server. That was not my question. I want to see a listing of all dbi_versions VS all SQL Versions.